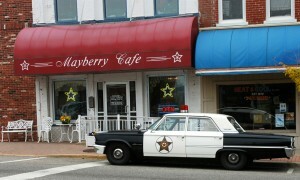 Upon arriving in Danville, Indiana, I was immediately bombarded with offers to eat at the Mayberry Cafe. After a satisfying experience at Court House Grounds during my first week in Hendricks County, I was ecstatic at the chance to try another local eatery. For any fan of "The Andy Griffith Show" (or for food enthusiasts who are in or will be in Central Indiana), the Mayberry Cafe, 78 W. Main St., Danville is a must. 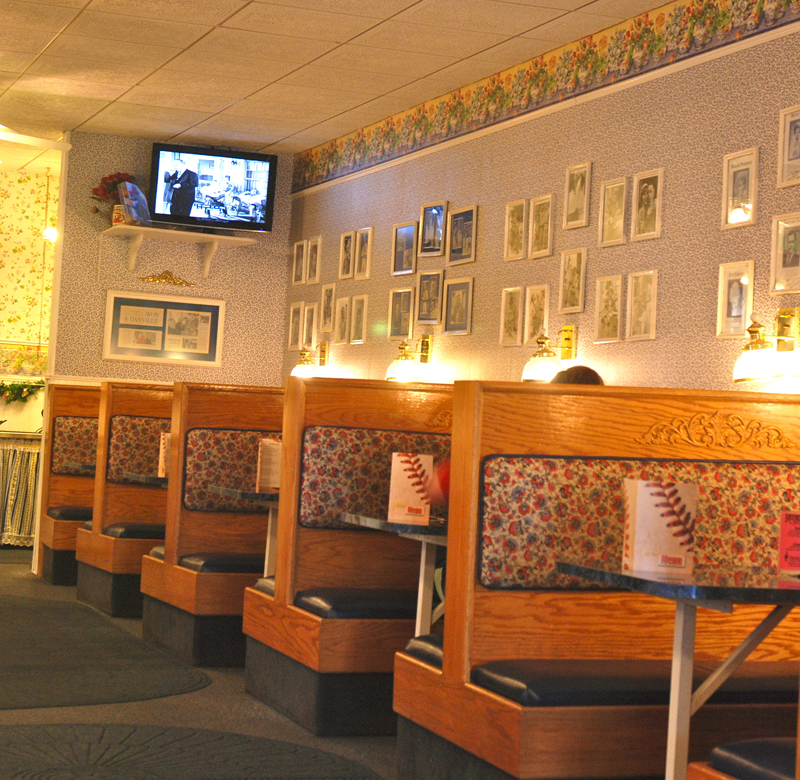 The cafe serves as a culinary preservation of the 1960s show and displays this faithfulness in every aspect – from the décor to the food dishes named after characters. This cafe is also perfect for a non-local on a budget, offering a nostalgic experience paired with reasonable prices. And most importantly, the food is mouth-watering. Still not convinced? Below are four more reasons you can’t ignore. 1. Atmosphere Mayberry Cafe is unique. From the moment I stepped into the space, the entire place felt extremely calm despite a lunch rush. Every facet of the décor –from the flowery wallpaper to the padded booth seating – was encouraging guests to slow down their lives and enjoy this moment. I was struck by the dedication to the “Mayberry” theme; it was the only successful themed restaurant I had ever experienced. The lack of Top 40 music and sports coverage on the TVs was extremely relaxing, and I felt more at home in this two-story reproduction than in any typical chain restaurant. Andy Griffith memorabilia, along with dozens of framed newspaper and magazine articles, were splashed on the walls. Television sets were also playing re-runs of the show, which proved to be very distracting when trying to have a conversation with my lunch date. In fact, the only thing that could distract me from all the wonderful, nostalgic décor was the food- which is the No. 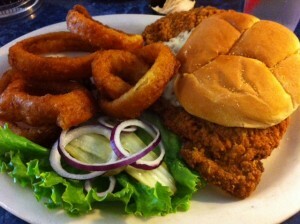 2 reason why a trip to the Mayberry Cafe is a must. 2. Comfort Food Mayberry Cafe is an all-inclusive dedication to the show, and its food is no exception. The café features basic American diner cuisine; however, the menu goes beyond the predictable fried chicken and gravy mashed potatoes (don’t fret – there is plenty of that to go around). The cafe offers seafood, chicken, pork chops, ribs, pasta choices and over a dozen different sandwiches. Everything from the soup and sandwich combos to Aunt Bee’s Fried Chicken looked delicious, but unfortunately, I could only choose one dish. I decided to go with Andy’s Tenderloin, a massive breaded tenderloin with provolone cheese, lettuce, onions and pickles with a side of onion rings. This dish was fantastic. 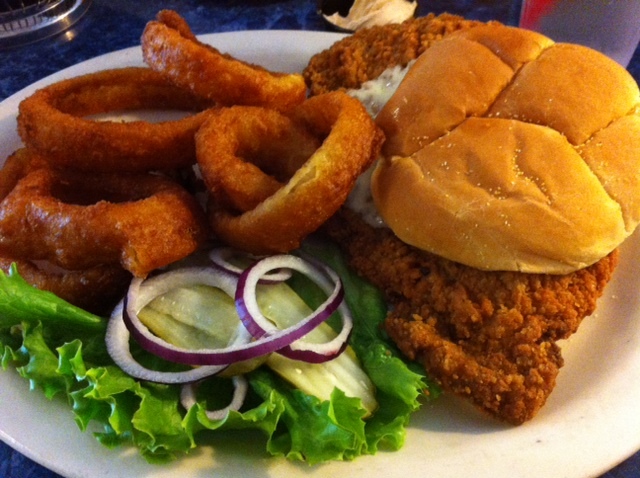 While the Mayberry Cafe isn’t the only restaurant to feature tenderloin, this one earned a place in my heart because it was massive and relatively inexpensive. For around $8, I got two meals worth of tenderloin. 3. Location, Location, Location Mayberry Cafe is located on the north side of the Hendricks County Courthouse Square in Downtown Danville in close proximity to multiple local businesses. Parked outside the restaurant is a 1962 Ford Galaxy that has been made to look like Mayberry&apos;s police car. Its presence has become a staple in the downtown square. 4. Something for Everyone Mayberry Cafe caters to all ages and even has its own annual competition. Starting June 1, residents will be able to vote in the 5th annual Opie Look-Alike Contest. The contest is open to boys 10 and under. The prizes are pretty sweet – one being that the new “Opie” will get a free meal every week for an entire year! (That’s 52 FREE meals, people.) Its hours are: Monday – Thursday: 11 a.m. – 9:30 p.m. Friday and Saturday: 11 a.m. – 10 p.m. Sunday: 11 a.m. – 9:30p.m. Love something about Mayberry Cafe that you didn’t see on this list? Leave a comment!